Does Your Jaw Crack or Pop? Do You Have Worn, Broken or Chipped Teeth? Do You Suffer with Morning or Nightime Headaches? Do You Have Jaw Joint or Facial Discomfort? We Can Help Reduce or Eliminate These Problems! With Dr. Rickards' special training in bite and TMJ evaluation, Concept Dental Centre can help you overcome these symptoms. Through analyzing your bite, Dr. Rickards can determine if you are a candidate for splint therapy. Splint therapy is a hard night guard worn while sleeping to help you relax your tired muscles and joint. After the splint is worn for a few weeks we can take records to determine the best course of action for you. Often times the treatment may be as simple as making a few adjustments to your teeth, with no freezing. This is a very sophisticated area of dentistry and has taken a great deal of studying by Dr. Rickards to provide this special service. If you have been chronically irritated by any of the above symptoms, we encourage you to speak to us about your concerns. How the jaw joint and the teeth fit and work together are intimately related and any disharmony between the two can result in numerous dental, muscle and joint problems. The relationship between the jaw joint and the teeth has no bearing on individuals displaying dental, muscle and jaw joint problems. This is a simplified explanation but is adequate to introduce this topic to you. Dr. Rickards feels strongly that the first explanation is the accurate one. His mentor in this very sophisticated area of Dentistry is the best-known researcher/clinician on this topic. His name is Dr. Peter Dawson, the author of "The Evaluation, Diagnosis and Treatment of Occlusal Problems" which is regarded as the gold standard in this field. Worn back teeth and/or worn front teeth. History of teeth and/or fillings breaking. "Notches" in your teeth, usually on the cheek side. These may or may not be sensitive. When sensitive, they can be VERY sensitive to everything: touch, temperature and sweets. Most patients are able to point these areas out by running their fingernail over the surface to find the notch. Accelerated and/or hard to control gum or periodontal problems (most commonly associated with the back teeth). Generalized tooth sensitivity, particularly when this sensitivity from time to time increases, decreases and may even go completely away. Difficulty in chewing on certain teeth, particularly if it comes and goes over time. A classic symptom is the individual who wakes up in the middle of the night or in the morning with a headache in the temple area of their head. Typically these individuals find that after massaging the area, these headaches often diminish or go away after about an hour. Stiff and sometimes sore muscles in your cheek area. Again, after massaging these areas, the soreness diminishes or disappears. A similar discomfort can be experienced in the muscles on the side of the neck. Patients who have a very limited jaw opening. Clicking and popping in the jaw joint area upon opening andor closing of the jaw. History of the above although it may have appeared to have gone away (it may have in fact gone away or it may have advanced to a further stage). A history of your jaw locking open. Tenderness in the joint area when chewing. A progressive opening in the space between your upper and lower front teeth when your back teeth are closed together (this is a sign of a fairly serious problem in the jaw joint itself). We want to make it clear that people having a disharmony between their naturally seated jaw joint position and their fully closed bite may have no signs and symptoms, only one or two of these signs and symptoms, or many of them. This all depends on many factors such as: gender, age, genetics and good or bad fortune. Just as with any system in our body, some people are more resistant or sensitive to disease. Do a thorough tooth, gum and jaw joint examination. Depending upon what we find, we may suggest we fabricate a special splint for you. In most cases the splint will be worn at night for anywhere between 3 weeks and 3 months. For more severe cases, we may recommend the patient wear the splint during the daytime as well. This splint will help us ensure that we have identified the source of the problem as your symptoms should disappear or greatly diminish after wearing a properly adjusted splint. At this point, we will take special records of your teeth and jaw relationship to study and determine our next course of action is. In some cases, you may not need to go through the splint therapy procedure and proceed immediately to the records. After we have got our TMJ patient comfortable with the splint, we now go to their options. These can vary between things such as; making minor adjustments to the teeth and no longer needing the splint, an orthodontic referral, an option of crowning certain teeth, continuing to wear the splint at night, or even just the use of BOTOX® in certain muscles. Usually there are a number of ways to eliminate the need to have a splint. The courses of action we may take could range from making adjustments on your teeth, to crowning (capping), orthodontic referral, BOTOX®, or a combination of the above. For years we have used nightguards and special nightguard splints (for jaw joint treatment) with very good results. What these do is to simply make your teeth hit more evenly and offer a little bit of a cushion effect. These can work very effectively... as long as you wear them every night. The problem is that not very many people enjoy wearing a nightguard so they eventually stop, even though they are still clenching. Stop clenching at its source or weaken the muscles. Unfortunately it is not currently possible to stop clenching at its source without powerful medications that make it impractical. However weakening the muscles is a very simple and safe thing to do. 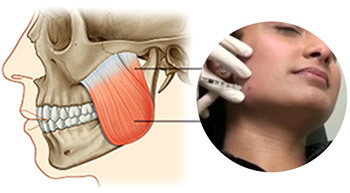 One single BOTOX® injection into each masseter muscle will do the trick very nicely. One of the beautiful things about BOTOX® is that it is temporary, so you can try it without permanent effects. Within days of the BOTOX® injection, you can stop wearing your night guard or splint, until the BOTOX® wears off. This is where, up until now, it was really a matter of guesswork as to when to administer another BOTOX® treatment. What we do now is measure your bite force prior to BOTOX®, then within a week afterwards. We will see a significant drop in bite force without noticeable affects to chewing. Normally BOTOX® lasts 3 months so we would check again at this point. Depending on the reading from our bite force monitor we can tell you if you need BOTOX® again. One really exciting thing about this is that when you BOTOX® a masseter muscle, it is not getting exercised as much , therefore, it starts to shrink. We will often see patients faces becoming slimmer, sometimes after one treatment. Of course this is not what we are seeking to do but it is a cosmetic advantage that many people seek, I consider it a pleasant side effect. Most importantly what this means is that over time, the required BOTOX® treatments will be able to be spaced further apart. The ultimate goal is to get to the point where they are no longer needed. Using BOTOX® to weaken the bite forces is an extremely simple, effective procedure, and much cheaper in the long run with respect to dental repairs. Knowing when to repeat it and when to confidently end the treatment requires the bite force monitor, which is a device that we have created and is unique to our office. So, if you have issues with teeth breaking, wearing down, general sensitivity, worsening gums despite excellent oral hygiene, you may wish to consider assessing whether reducing the force of your bite may help. Why is it useful in dentistry? At Concept Dental Centre, Dr.Rickards recommends BOTOX® to help ease the discomfort of day or night time clenching, as well as to limit Occlusal Disease & Muscular Disorders, by decreasing the biting force of the masseter muscle. BOTOX® is injected into the masseter muscle to help relax and stop the transmission of impulses within this muscle to reduce its force. The procedure is quick, painless and effective. Bilateral (both sides) injections are 240.00 - 400.00 and may be covered by a health care plan. Effects last 3 - 4 months and must be repeated. 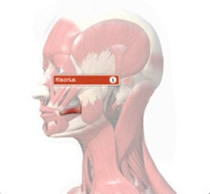 Please note, our target muscle is the masseter but sometimes the Risorius muscle can be affected for a short period of time. Muscles that are located in the head, neck and jaw require nerve impulse to become tense or knotted. Without the nerve stimulation, the muscles are not able to tense up causing TMJ discomfort. BOTOX® Therapeutic is injected into the affected muscle (for our purposes the Masseter Muscle) which block the nerve impulses from reaching the muscle. This blockade permits the relaxation of the muscle injected and diminishes the transmission of signals to the muscle, thus, decreasing the ability to clench. Patients should notice an improvement in severity of clenching and sensitivity within 2 weeks. It will last for a 3 - 4 month period after which time the treatment should be repeated for a period of two years. Over this time the related muscle will become more permanently relaxed and frequency of treatment can be significantly reduced. "Real Time Bite Analysis" , is an innovative system that allows us to quantitatively measure bite forces on patients with signs and symptoms of "Occlusal Disease" ( as discussed above). We do this using special bite force sensors,as well as bite trays designed by Dr.Rickards. We measure your bite force prior to BOTOX® treatment then periodically after to determine when you need another treatment of BOTOX®. This saves you money by reducing the number of BOTOX® treatments you should receive. "Being highly motivated to provide the best for my oral health,... I have had extensive dental work done to my teeth. Braces when I was in my teens and now porcelain veneers. It was through this process and the other side effects of headaches, facial tension, jaw tension, cold sensitivity and general fatigue that Dr Rickards determined that I had a severe clenching problem. It was also leading to a recession of my gums especially on my back teeth and then they started to get sensitive where I could not have anything cold – like ice in a drink or ice cream. I have had my original set of veneers replaced with new ones as I was wearing my original ones out (after 10 years). It was about a year and half ago that Dr. Rickards suggested regular botox injections to help relax my jaw muscles. When he did my last veneers, he did special bite adjustments and I underwent botox shortly after. My teeth, my jaw, my headaches have never been better. I am not very good at keeping track of when I need my botox but all I do know is when I start feeling my headaches (tension) coming back and facial fatigue during the day from clenching, then I know I am due. My veneers are beautiful and staying that way and my jaw muscles have NEVER felt this good – going back as far as I can remember. Thank you Dr Rickards for making such a difference in my life – it is truly a freedom that can’t really be explained unless you suffer from similar problems. Not to mention, I have a beautiful white smile to go along with it!!!"